Despite the name of 'Set 1' this is in fact the follow up set to the first set released on this subject, Project R.F.Z. 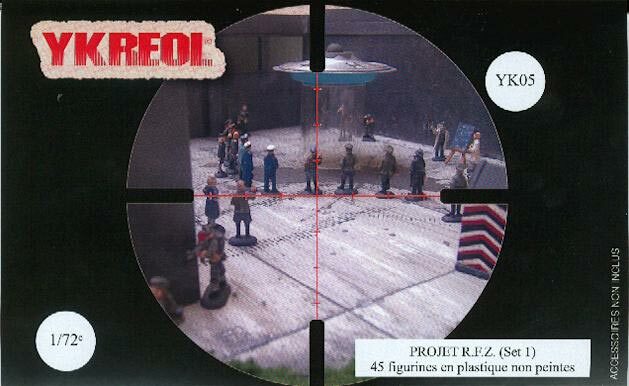 (Set 2), which review explains the background to this most unusual subject. 'Set 1' looks to be just an extension of the first set, with pretty much more of the same. The majority of the figures seem to be German officers, with no particular indications as to arm of service or unit. One has a double-breasted jacket that might suggest the navy, but otherwise they are quite generic and reasonably accurate. The first figure in our second row looks to be a civilian, and could possibly even be intended to represent Hitler. The figures in the bottom row all seem to be German soldiers, two men smartly at attention and neatly attired, suggesting a formal guard such as would have accompanied Hitler. The man wearing the coat in the bottom row seems to wear a gorget, as does the man with the dog, which would make them both Feldgendarmerie or military police. The final figure is interesting because he holds the StG44 assault rifle that came into service in 1943/44, but with a very large infrared night-vision device. This is the Zielgerat 1229 Vampir, a device that was developed late in the war but may or may not have actually been used in combat. This is not a great model of this, and it lacks some of the leads and finer details, but the figure does correctly have the battery for the lamp on his back and is carrying the correct ammunition pouches for his weapon. Quite what this all has to do with the subject at hand we cannot guess, but it is an interesting addition even if it is not appropriate to use it on the battlefield. On the wider issue of accuracy all the officers and soldiers look fine as far as can be seen. The horse carries a fairly cut down version of the usual kit, but surprisingly has been given a sabre. This has been correctly placed on the apparently less appropriate left side of the saddle because the rifle was placed on the more accessible right, although on this model the rifle and its holster are missing. In any event the sabre was withdrawn long before the later part of the war, so again its presence in what is obviously a late war set is hard to explain. These figures are quite flat and the sculpting is really quite bad, with vague detail and a rough finish. The left leg of 'Hitler' is very badly withered, and faces are ugly and poorly proportioned. There is also a great deal of flash in virtually every seam, with some enormous tabs in places, so these figures will require a lot of work to make the best of them. Much like the first set this is an eclectic collection of figures where a common theme seems hard to find. 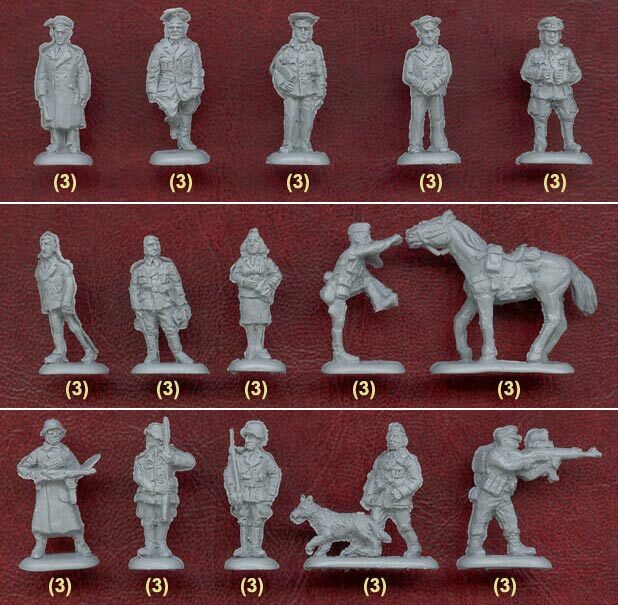 Apart from the many officer figures perhaps it is safest to say this is a World War II German set that contains figures you are never likely to see elsewhere, which if nothing else makes it more notable in a hobby that is awash with sets of World War II Germans already.